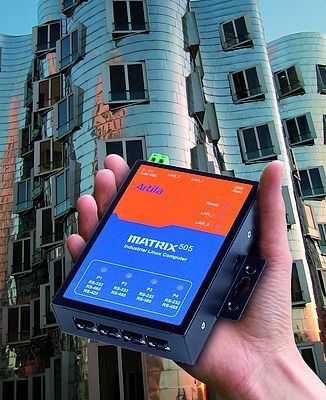 The Matrix series industry PCs from Artila (distributor: acceed) have proven their worth in industrial use thanks to their robustness, low energy consumption and compact construction. The series has now been extended with the Matrix 505. The new model offers two 10/100 Ethernet interfaces, two USB 2.0 host connections as well as a microSD slot for memory cards up to 32 GB. An ARM9 processor with 400 MHz works in the fanless PC metal casing. The working memory in this new Matrix family model was doubled to 128 MB. For the extension of the flash memory, a microSD slot which enables capacities of up to 32 GB is available in the new model. With its dimensions of 108 × 78 × 24 mm, the device is space-saving and suitable for installation in restricted surroundings such as switch cabinets and cable ducts. The device has four RJ45 connections which can be used as serial interfaces according to the RS 232/422/485 standards. Additionally, two USB-2.0 host connections and two 10/100 Ethernet interfaces are available. Connected in the voltage range from 9 to 48 VDC, the Matrix 505's power consumption is around a mere 3 watts. This energy and hence cost efficiency from the hardware side is accompanied by the use of open source software. Linux 2.6.38 and the C/C++ tool chain are pre-installed.